BRYAN EATON/Staff photo. 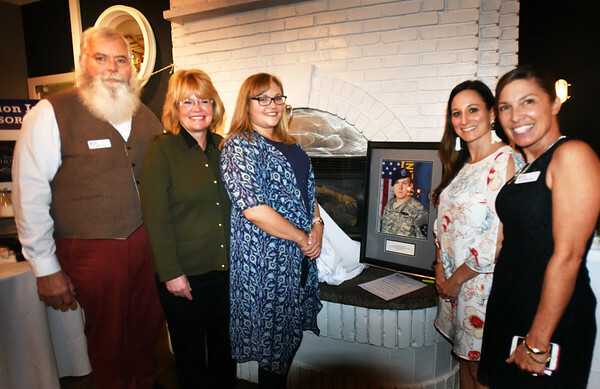 The Amesbury Educational Foundation Inc. held their 16th Annual Night of Giving which gave away $23,000 in grant's including $13,367 to district special education teacher Ami Henderson from the Jordan Shay Memorial Grant. From left, Ralph Noon, president of AEFI; Shay's mother Holly, who presented the grant; Shay's girlfriend Kelsey Chandonnet with Melissa Fournier and Irene Mahoney, event co-chairs. Jordan Shay was a 2005 graduate of Amesbury High School who was killed in action in Iraq.